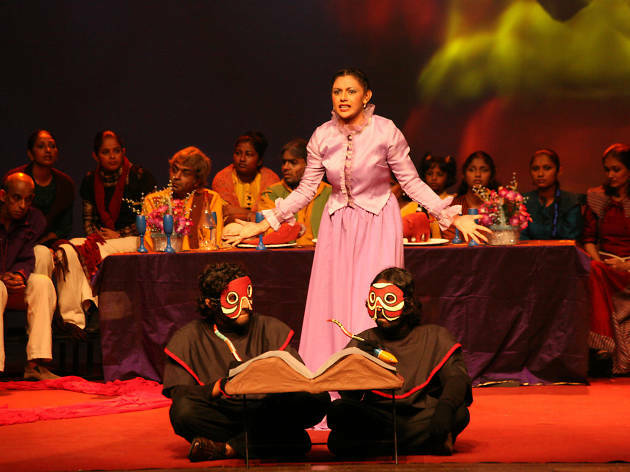 Makarakshaya’ is an adaptation from the play ‘The Dragon’ written by Soviet playwright–Yevgeny Shvarts, and it was translated by Siril C Perera. This play is a produced by Dharmasiri Bandaranayake. It won 12 awards at the State Drama Festival in 1985, under the categories: Best Production, Best Drama, Best Music, Best Play, Best Director, Best Translation, Best Costume Designing, Best Lighting and Best Choreography. The artists cast in Makarakshaya include: Yashoda Wimaladharma, W Jayasiri, Janaka Kumbukage, Lakshman Mendis, Chula Jayawardena, Sudhesh Wickramasinghe, and many others.